Read this post first: Dietary Restriction: Impact On Health And Longevity. This is a continuation of the prior posts: Dietary Restriction: Impact On Health And Longevity, which summarized the benefits of caloric restriction (CR), Protein Restriction Increases Longevity, and Periodic Fasting Increases Health And Longevity. This post will deal with another alternative to CR, CR plus exercise. "Some studies have found that CE does not elicit health-promoting benefits beyond those elicited by CR." There were a few benefits, mostly muscle-related: "CE has been shown to attenuate age-related sarcopenia. ... CE reduces muscle fatigue and may increase the oxidative capacity of muscle fibers." And CE may reduce levels of C-reactive protein." "The addition of exercise to a CR regimen does not appear to affect an animal's maximal life span." "Many human CE studies have incorporated a total caloric reduction of 25%, with 12.5% coming from exercise-induced expenditure and another 12.5% coming from reduced caloric intake (i.e. diet)." "Many investigations have noted no significant difference between CE and CR regarding their respective effects on fasting insulin levels, DNA damage, muscle mitochondrial gene expression, triglyceride levels, and liver lipid content." "Two investigations have noted a further reduction in both diastolic blood pressure and LDL cholesterol with CE when compared to CR alone [67,89]." "Other work has noted that CE improved insulin sensitivity, while CR-alone failed to do so." "CE has been shown to increase bone mineral density at the femoral neck." "Collectively, although results are somewhat mixed, it appears that the addition of exercise to a CR plan may provide further health benefits." So, there was little additional benefit gained by appropriating some caloric deficit to expenditure, except that seen in bone and muscle, two areas where the benefits of CR alone were lacking ("Unfortunately, CR does not appear to retard the age-related loss of bone and muscle mass."). Those are still mighty important areas when it comes to quality of life and living independently. Also, adding exercise might help achieve CR without extremely cutting caloric intake. Unfortunately, exercise has a profound effect on appetite. Caloric restriction (CR) of at least 20% extends life and improves health. Protein restriction, but not carbohydrate or fat restriction, offers similar benefits to CR. The amino acid methionine, found primarily in animal food, is likely responsible for this. Periodic fasting offers some benefits and has been shown to extend life in animals, but research, especially in humans, is sparse. Adding exercise to a CR regimen offers little additional benefit save for improvements in bone and muscle. ________1 Impact Of Caloric And Dietary Restriction Regimens On Markers Of Health And Longevity In Humans And Animals: A Summary Of Available Findings, Nutrition Journal, October 2011. 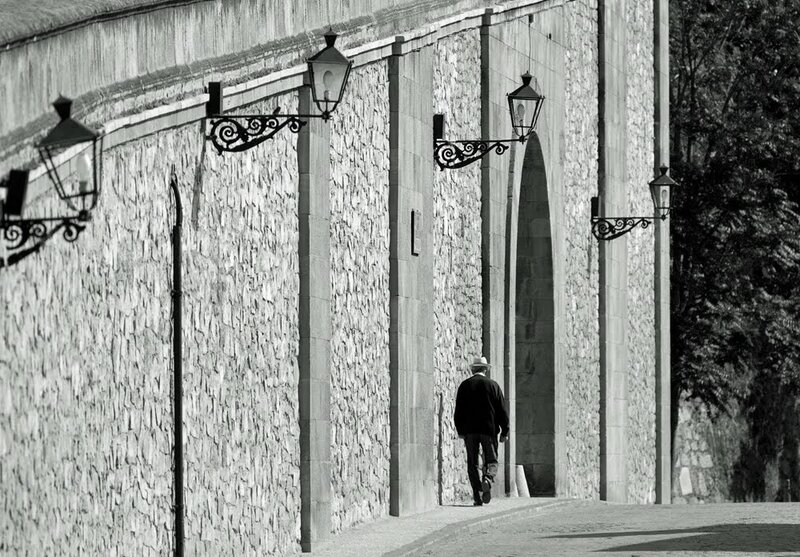 Photo of man walking in Segovia, Spain from Slight Chance Of Pixels. Bix, I don't understand your statement "Unfortunately, exercise has a profound effect on appetite." What do you mean? I exercise a lot and have a healthy appetite which means a Goldilokcs appetite: "not too much, not too little, just right." A quick Google search show the research on exercise and appetite is inconclusive. My experience tells me that people who exercise a lot are also at a healthy weight. Eating healthy foods and regular exercise puts one at a healthy weight and fitness level. The idea that exercise causes you to eat more food so you'll probably get fat if you exercise is just plain wrong. Now then, if you follow the marketing hype about sports drinks and down a couple of 20 oz. Gatorades before, during or after your workouts, you could gain weight. Just drink water. My point was that if you are attempting caloric restriction (CR), which is no small feat, anything that revs up appetite can make CR an even bigger feat. Exercise has a profound effect on appetite. This is a vast and complex area of study. I only skimmed the surface in grad school. There is, of course, great individual variability in response to exercise - physiologically, psychologically, behaviorally. For some people, long-term exercise stimulates compensatory increases in energy intake that attenuate weight loss. Even if exercise caused someone to not meet these rather thrilling cut-offs for CR, I still think it has value, as you said. It has been shown to improve insulin sensitivity, bone density, blood pressure, body composition, and mood. I like the phrase "Goldilocks appetite." I never heard it. What if I do a little of everything, like skip the morning granola bar, take walks, fast on Fridays and eat like a vegetarian diet. I wish I had a Goldilocks appetite. I have a Godzilla appetite. A Godzilla appetite! Hm, what is Godzilla, a lizard? I should trademark the "Goldilocks Appetite" and I will leave it up to Claudia to trademark the "Godzilla Appetite". I think the Godzilla Appetite follows the Godzilla Diet and it is the most popular diet in the U.S. judging by the obesity statistics. I don't know if its a lizard. I was thinking of something that eats everything in its path. By the way, I haven't had an animal food in three weeks. No cheese, no eggs. I've even begun to like the taste of soymilk. And I feel great. I'll keep you posted.